PRINCETON, N.J. -- About half (48%) of small-business owners who accept credit cards now have chip-enabled systems in place. This is up from 31% in the third quarter of last year, just before new rules on liability for credit card fraud committed at point-of-sale card readers took effect in October. The new rules transfer liability for fraudulent transactions from the payment card companies to the businesses unless they have upgraded to an EMV-enabled system (Europay, MasterCard, Visa) that accepts chip-enabled credit or debit cards. 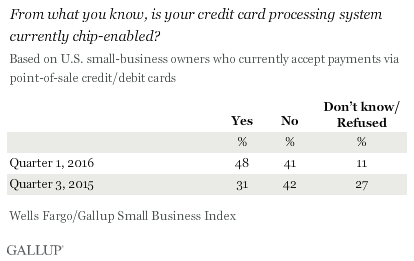 About three in 10 small-business owners interviewed as part of the Wells Fargo/Gallup Small Business Index survey accept credit or debit cards for payment at a traditional point-of-sale terminal. 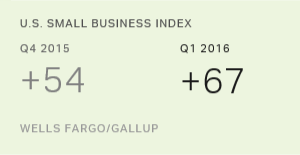 Most small-business owners who accept credit card purchases but have not yet upgraded say they will upgrade at some point in the future. Thirty-six percent of these owners plan to upgrade in the next 12 months, while 41% do not have a specific date in mind. Additionally, 20% say they never plan to upgrade to chip-enabled processing equipment. Small-business owners who accept point-of-sale credit card purchases needed to be in compliance with the mandate beginning in October 2015, or risk being held liable for fraudulent purchases using non-chip-enabled equipment at their places of business. While compliance has increased since last year, about half of owners who accept credit and debit cards have not yet upgraded their equipment -- although most say they will at some point in the future. Results are based on telephone interviews with 600 U.S. small-business owners in all 50 states, conducted Jan. 11-15, 2016. 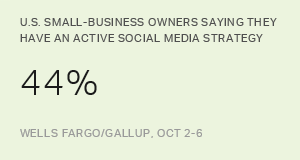 For results based on the total sample of small-business owners, the margin of sampling error is ±4 percentage points at the 95% confidence level. For results based on the sample of 245 small-business owners who currently accept payments via point-of-sale credit or debit cards, the margin of sampling error is ±7 percentage points at the 95% confidence level. 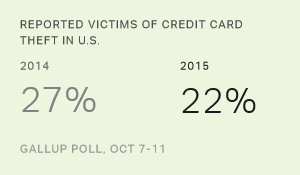 Fewer Americans today than in 2014 say the credit card information they have used at stores was stolen by hackers, and fewer say they are highly worried about credit card theft than were worried in 2014.